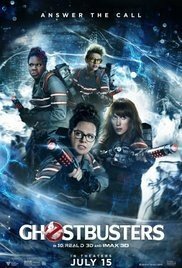 The movie the internet loves to hate, GHOSTBUSTERS (2016) starring Melissa McCarthy, Kristen Wiig, and Kate McKinnon has finally reached local theaters. Few other new releases in my memory have opened to such negative publicity. This reboot of the original GHOSTBUSTERS (1984) was difficult to sit through as I found myself just biding my time until Murray, Akyroyd, Weaver, and Potts alternately made their brief cameos. Although original cast mate Harold Ramis passed away in 2014, even the brief appearances of the remaining cast did little to salvage this 2016 version. I found the movie not only predictable with amateurish special effects, but the characters were so one dimensional they were of little more substance than the action figures that Mattel is successfully marketing. Lead actress Melissa McCarthy is sporting a noticeable weight loss, a change that might now propel her out of the class-clown roles into something more substantial. As mentioned earlier, the internet continues to bash this sequel, even prompting actress Leslie Jones to cancel her personal Twitter account on July 18th, 2016 after receiving repeated and increasingly vicious, abusive, and racist tweets from users claiming her character Patty Tolan was little more than a stereotypical African American. Directed by Paul Feig, Rated PG-13, 116 Minutes, Comedy, Fantasy, Sci-Fi, ** 2 stars out of 5. I predict that within a month GHOSTBUSTERS (2016) will quickly fade out of the spotlight as the public tires of the controversy and the movie loses its’ new release status. Another summer sequel that fails to deliever.